Since the beginning of mankind, humans have kept records of events. These narratives shape our civilization. People turn to the history books to learn about the past, understand the present and possibly predict the future. But visual art can sometimes render words unnecessary. Such is the case of Ken Kaminski and his paintings that chronicle the events of 911, the recovery period that continues to unfold and indeed the period before September 11, 2001. 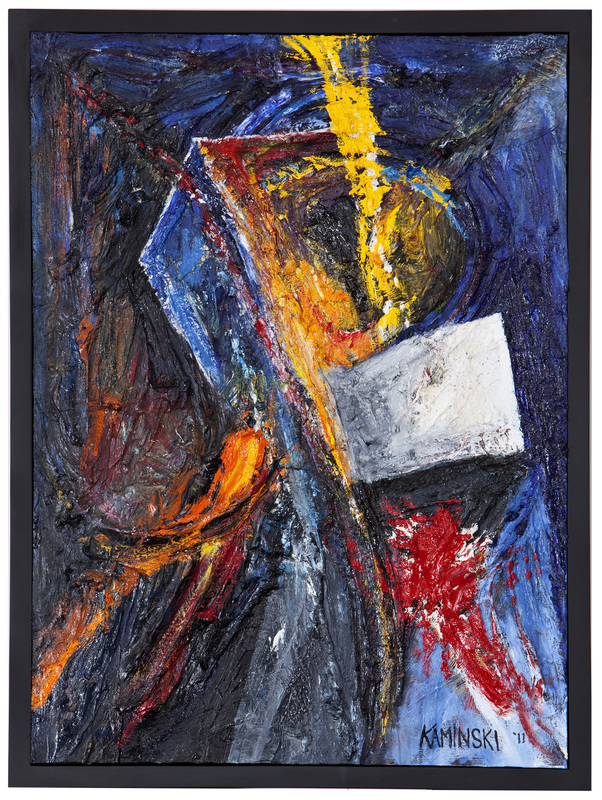 Through hues of purple, yellow, red, blue, black, white, and through the style of Abstract Expressionism, Ken Kaminski retells a story that is permanently etched in the minds of everyone in this nation. 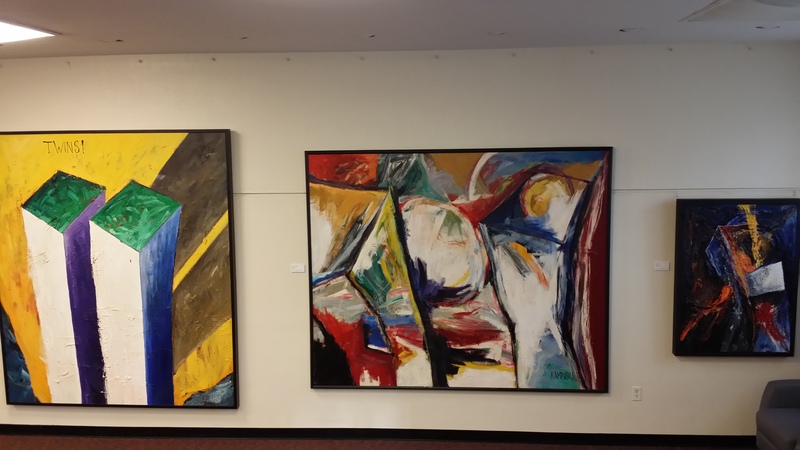 Last August Kaminski’s 9/11 Paintings were featured at Fairleigh Dickinson University’s Edward Williams Gallery. This exhibit offered viewers a pictorial on canvas spanning from the airplanes slicing through perfect blue skies, to the chaos and destruction of the twin towers and ultimately their demise. And like history, the lessons of the past can and sometimes do repeat themselves. With Kaminski the story of his 9/11 work has come back around again and although the plot is slightly altered, the impact is just as potent. 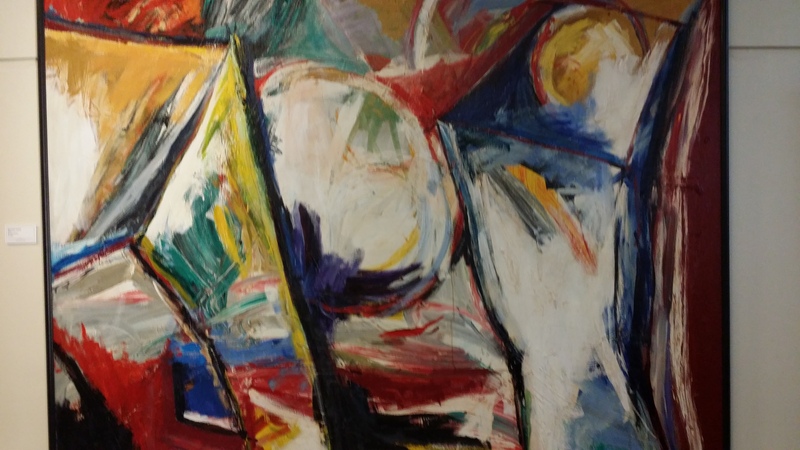 On January 31, Kaminski’s Recovery Paintings exhibit opened at Walter Wickiser Gallery. 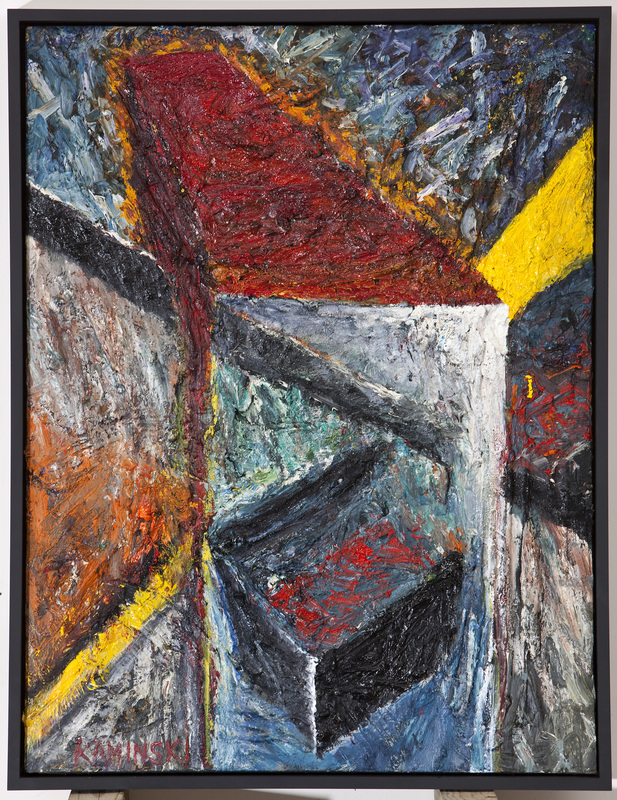 The exhibit is comprised of seven paintings: Baghdad (1991), Wounded Towers (2002), Collapse (2011), Intersection (2011), Intersection 2 (2011) and Ghost Towers (2011). On the crisp white walls of this Chelsea gallery, Kaminski’s paintings and the story they convey take on new life. The tale begins with Baghdad. Geometric shapes burst from a tawny plain. Waves of red and black anchor the bottom to the painting. In a way these impressions look like oil and blood that has been shed for that oil. Dead center is a bull’s eye. If a history buff was inclined to trace back the events that led to 9/11 one would have to make a stop at Baghdad, in fact, some might argue it was the first ground zero. Wounded Towers goes straight to the center of that horrible day. As the towers bend, slowly yielding to their fate, bold colors of red, white, blue, yellow, green and black entangle the surface. Between the brushstrokes and paint Kaminski smeared with his fingers, the agony of the fuming towers is consciously and unconsciously evident. While I viewed this painting last year, this time I was able to see a under case “p” resting in the middle. When I saw it I was gobsmacked. Why haven’t I seen it before? P…pain, and why haven’t I ever used that word to describe that day? Collapse is an overwhelmingly tumultuous piece. You can see the tower being taken asunder in copious shades of blue and black and streaks of yellow and orange and a splash of red. 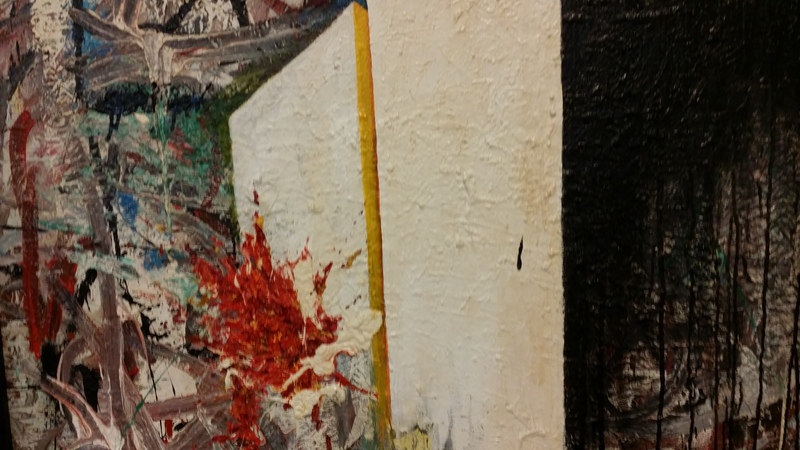 As with Wounded Towers a “p” appears in the center of the painting. It’s dark and sweeps over you like a tidal wave. Intersection and Intersection 2 return once again, and more directly, to the geometric shapes that are present in Baghdad only these shapes are surrounded by thicker, darker hues. The dense globules of paint reminded me of the soot that covered the surrounding area of Ground Zero or the heavy plumes of smoke that hovered over the smoldering remnants for days. Like its title these works act as a conduit linking what was to what is and the possibly of what might be. Ghost Towers is a piece with spiritual dimensions. In this work Kaminski pays homage to lives lost on 9/11. In total, all of these works tell a distinct story about history from a very distinct point of view. But chronicling modern events using paint and canvas is only one of the narratives this exhibit tells. The other signifies the title of the exhibit itself, Recovery Paintings. 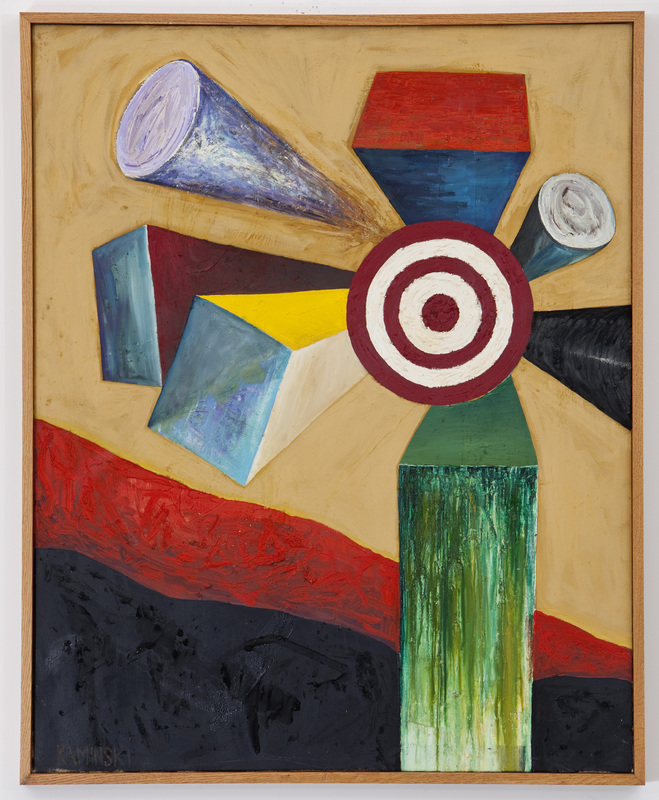 Although Kaminski has fused sociopolitical themes into his work previously, the paintings that were influenced by the events of 9/11 were his therapy – a way to reconcile the horror and enormity of a moment in time that continues to affect us. Indeed his recovery has become our recovery and as we continue to look back on 9/11 while trying to navigate our present and future, Kaminski gives a starting point that can be used in our healing as we continue to record and create history. One of my favorite childhood fables was the story of Henny Penny. What always stuck with me was the repeated use of the phrase, “The sky is falling.” It was the first time I was ever confronted with a tale that dealt with hysteria. How could I had known that one day I would feel driven to scream those exact words, but when I saw the twin towers ablaze and the mayhem that was unfolding in real time as we helplessly watch on TV, I felt like that manic chicken wrought with panic and fear. September 11, 2001 is a mental scar I’ll always carry with me. As intense as the memories are of that day, I can scarcely remember any color with the exception being the perfect blue sky that offered the delusion that nothing that terrible could befall us. What I remember most are the feelings that coursed through me at rates so fast I could barely record them, terror firmly placing a grip around my neck, anxiety tapping Morse code up and down my arms, disorientation mushrooming in my brain and grief taking possession of my heart. I returned home from my job, where we had to evacuate because of a bomb threat, turned on my TV and laid down on my bed to hear the sounds of faint whistles from dying firemen. I felt absolutely defeated. The tragedy of 9/11 left this country reeling and sent us all on our own journeys as we tried to reconcile what happened. Ken Kaminski’s journey took him to the canvas creating a series of work that spans well over a decade. 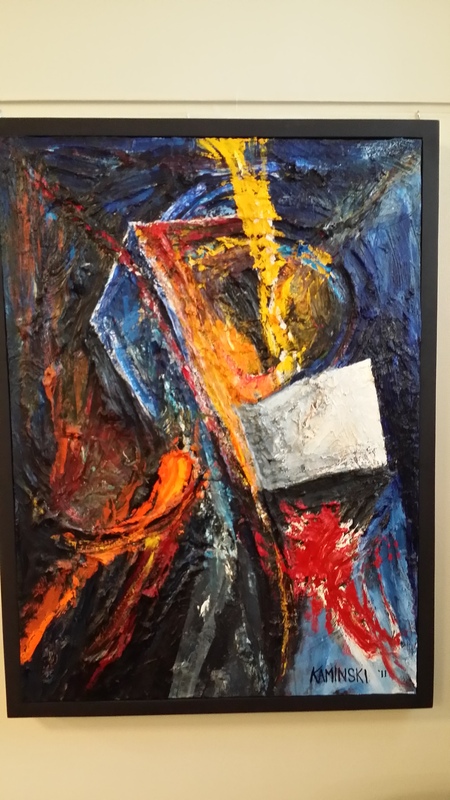 Using the template of abstract expressionists like Willem de Kooning, Jackson Pollock and Emerson Woefler, Kaminski has attempted to record the events and emotions of that day as well as the recovery period that continues to shape us. His efforts also allow those who are too young to remember 9/11 the ability to witness the emotion of that day. FAMERS I am here to report that his endeavors are wildly successful. 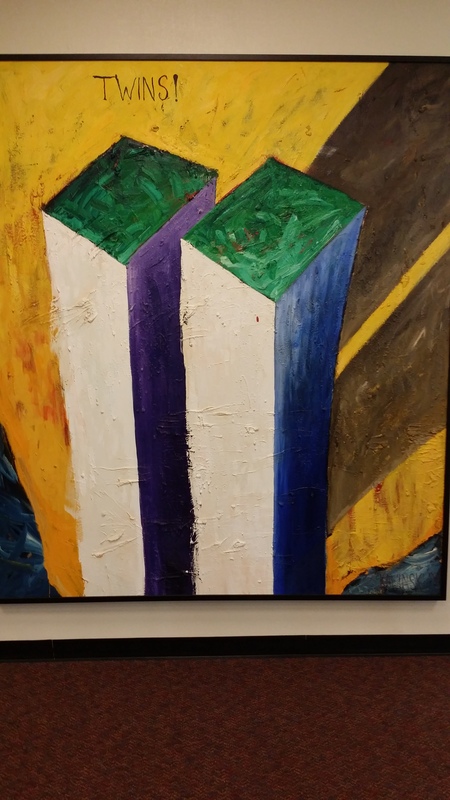 I had the pleasure of viewing a few of Kaminski’s 9/11 paintings at the Edward Williams Gallery, located at Fairleigh Dickinson University’s Hackensack campus. The exhibit includes eight selected works that brilliantly convey the events of that day brightly expressed in various hues. 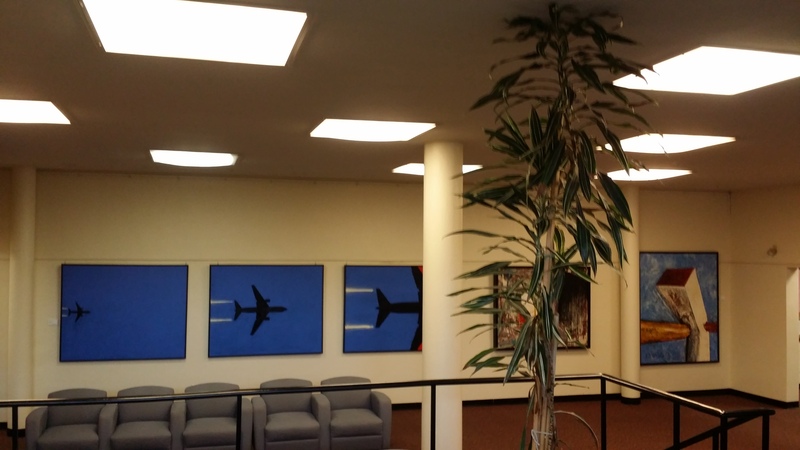 The exhibit begins with Blue Sky Day – triptych. This three panel painting brings you face to face with speed of these flying bombs and the majestic sky that it corrupted. 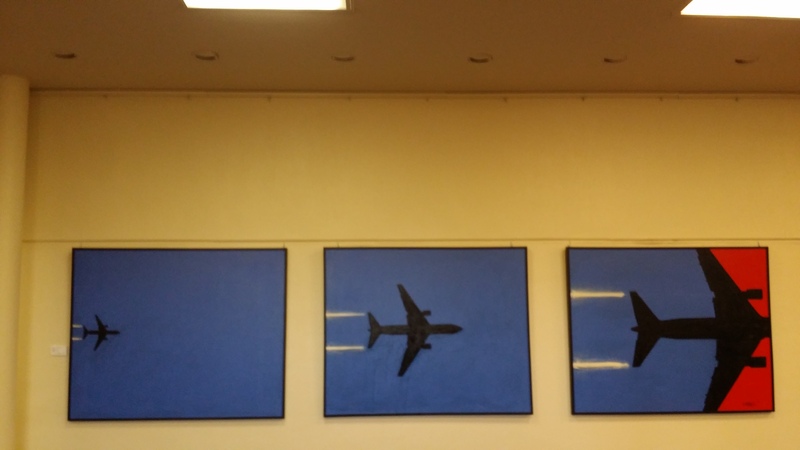 With each panel the viewer sees the countdown of the planes getting closer and closer until it hits making its bloody and destructive impact. 911 The Moment It Happened is an eerie mix of color. The space surrounding The World Center no longer is colored in blue like the atmosphere painted in Blue Sky Day, instead the blue is muddled with streaks of different colors showing the chaos that followed the impact of the first plane, represented in an explosion of oranges and reds bursting from the side of the tower. Streams of black cover one of the towers like a foreshadowing of despair to come. Blindsided shows the line of fire going straight into one of the towers then blasting out of the other side. Crippled from the blow, the tower bends and the pain is obvious. All that is missing is the scream, but if you remember the sound of the planes hitting the towers, then this painting will ensure that the awful roar of the plane echoes in your ears. Blindsided is an acute observation of a drive-by. Twins! is a stoic, almost haunting, vision of The World Trade Center towers before 8:46 a.m. September 11, 2001. They were proud and victorious, a symbol of might and power. They represented everything that was great about The Big Apple. 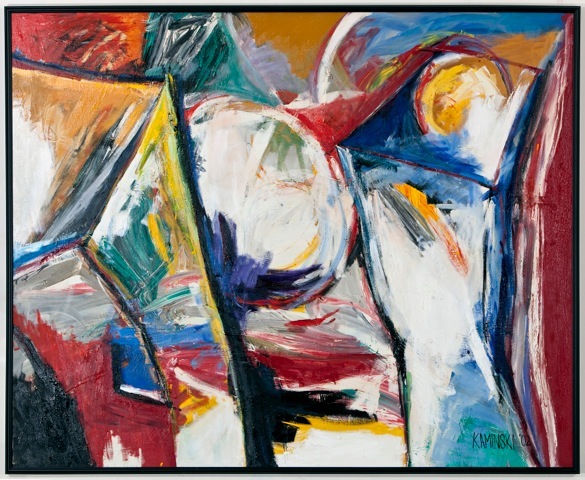 In Kaminski’s painting they appeared alive and vibrant again instead of frozen as they are in photographs. 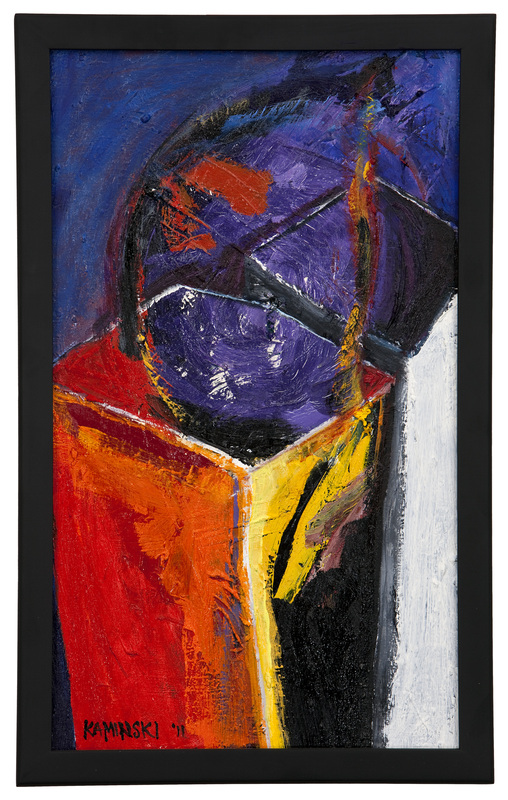 The yellow background also contributes to the energy of the piece. It makes you long for the nostalgia of what used to be. If this painting were a song, it would be called The Way We Were. Wounded Towers is a kaleidoscope of disorder. The colors vividly capture the confusion permeating the area as people scrambled for safety and the bent, smoldering towers desperately tried to remain the symbols of glory that they once were, a last valiant effort before they ultimately disintegrated into dust. Collapse is engulfed in a blending of hues that bring chills to the spine. The voices of those who were lost don’t just whisper, they shriek. It shows the true potential of visual art. There are no words necessary, this painting is one of the most telling portraits of pain and suffering that I’ve ever saw. If someone wanted to understand the mood of the country when the tragedy of 9/11 occurred, all they would have to do is view this painting. Considering this year will mark the 13th anniversary of 9/11, I believe Kaminski’s exhibit couldn’t visit the New York metropolitan area at a better time. It allows another way for us to remember and venerate a day that will forever be a part of our history. Kaminski’s work carries with it a raw, emotional ambiance. It pulls you in. No matter how hard the visuals may be to look at, Kaminski’s work burst past your pupils and forces you to deal with whatever memories or residual feelings you may have buried. For as much as Kaminski’s work is steeped in tragedy, it is also immersed in the resilience of the city of New York and its people. Yes, the sky did fall, but we didn’t get mired in the pain. We stood atop the ashes; we rebuilt and honored those we lost. The 9/11 paintings are not only powerful and healing; they are a testament that when an artist creates from his or her soul the work that is generated is timeless. To learn more about Ken Kaminski and view more of his work check out, http://www.kenkaminski.com/. 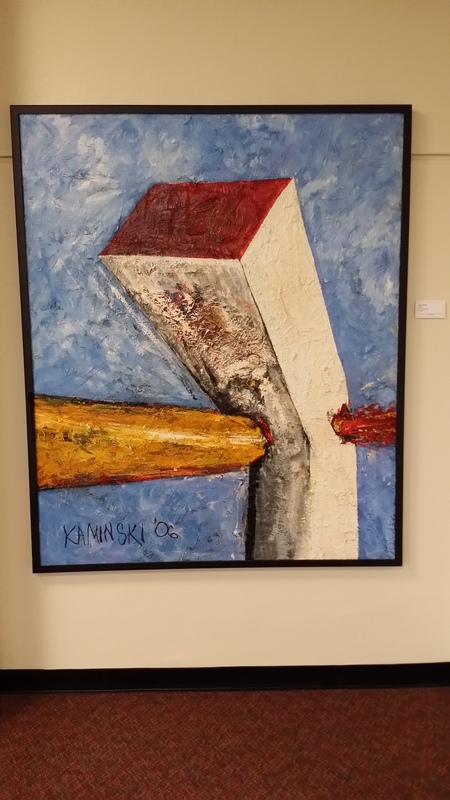 Kaminski’s 9/11 Paintings will be on display at the Edward Williams Gallery, located at 150 Kotte Place, Hackensack NJ, until 9/26/14. Gallery hours are 8:30 a.m. to 8:30 p.m. Monday through Friday and 9:30 a.m. to 2:30 p.m. on Saturdays.